Jesus fulfilled his earthly life of service by dying on the cross. In part 2 of “Jesus Served Through His Crucifixion” (Lesson 9 of the Servanthood Series), children will learn how Jesus’ arrest, appearance before officials, and mockery from others didn’t stop his service. Through his example we see that trials and obstacles can be endured when we are committed to obedient service to God. OBJECTIVE: To discover how Jesus served others and was obedient to God by dying on the cross. MAIN IDEA: Jesus was abused and mistreated before he died on the cross. He is the best example of a servant because he gave up his life so we could have a relationship with him. 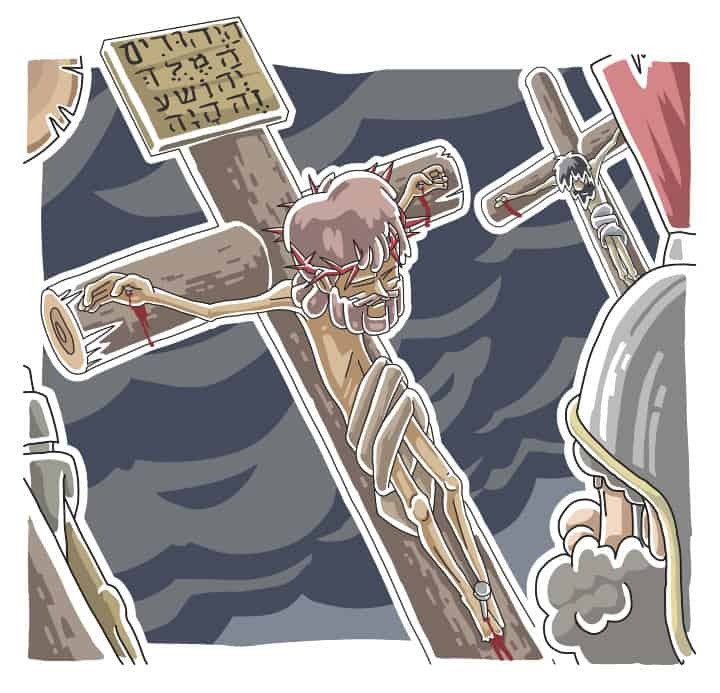 PREVIOUS LESSON REVIEW: Say, “Last week we learned the definition of ‘crucify’: to put someone to death (as a punishment) by tying or nailing them to a cross. We discussed several things that happened before Jesus was arrested, beaten, and crucified. Can anyone name the disciple who betrayed Jesus (Judas Iscariot)? And which disciple denied Jesus three times (Peter)?” Emphasize that we will continue to see in today’s lesson how Jesus willingly went to the cross as a servant in spite of betrayals and false accusations. Comment, “After being betrayed by Judas Iscariot and sharing the Lord’s Supper with his disciples, Jesus went to a garden to pray.” Read Mark 14:32-41. Discuss the intense emotions Jesus felt as he prayed – deep distress, overwhelming sorrow, etc. Ask, “Which disciples did Jesus take with him to pray (Peter, James, and John)? Why was he frustrated with them (because they kept falling asleep)?” Explain that Jesus was trying to teach his disciples that physical barriers – such as exhaustion – can get in the way of important, spiritual matters. We have to rely on the Lord for strength as we serve! Pass out the markers and “My Sins Died with Jesus” coloring pages. Say, “We are going to write sins inside the cross as a reminder of why Jesus died. His act of obedience unto death was the perfect example of servanthood.” Encourage the students to fill the cross with numerous sins and give suggestions if necessary. Afterward, the class may decorate and color the pages. RECAP: Jesus’ was arrested, beaten, mocked, and killed even though he never sinned. He equips us through the Holy Spirit to serve even when we face struggles and hard circumstances. Tony Kummer (Editor) reviewed & updated this page on : March 19, 2019 at 1:17 pm. All our content is peer reviewed by our readers, simply leave a comment on any post suggest an update.